I finally read Jeffrey Eugenides' Middlesex! I've had this book since 2007. I'm quite proud of myself :-) I didn't read the physical copy, though, but read the audiobook. And the audiobook is fantastic! I think that this is really an excellent method for me to get books that have been on my TBR list read more quickly, especially those that have been on it for years and years. 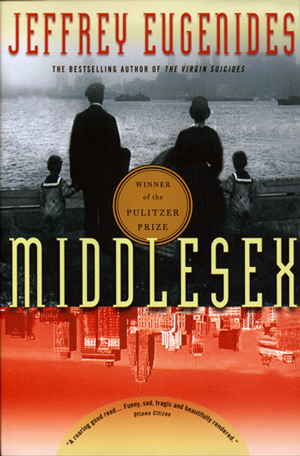 It's hard to find most of the old, more obscure ones on audiobook, but for books like Middlesex, which is quite popular, you're almost guaranteed to get a great narrator. And that's exactly what happened here! I really enjoyed this book. It's just the sort of multi-generational saga that can be so grand and epic when done well. I am so glad that I already own a copy of it so that I can hug it to my chest and sigh in satisfaction. "I was born twice: first, as a baby girl, on a remarkably smogless Detroit day of January 1960; and then again, as a teenage boy, in an emergency room near Petoskey, Michigan, in August of 1974." I fell in love with Cal, born Calliope, Stephanides from the first moment. He is a wonderful person to spend 17+ hours in the car with, relating the story of his grandparents' long-hidden secret, his parents' love story, and all of the small decisions and misses and coincidences that led to Cal's birth and so many other events. The book is all about identity and how much other people can influence our identities. Cal was born a hermaphrodite, raised as a girl, and then became a man. As you can imagine, this is a painful and difficult journey. The juxtaposition of Cal telling us his current situation - a lonely 40-year-old man working in the Foreign Service so that he never stays in the same place for long - and that of his past - growing up in a loud, opinionated, and hilarious Greek immigrant community - is handled very well and brings so much to the story. As a member of a different loud, opinionated and close-knit immigrant community, much of what Calliope went through growing up resonated with me. And this is really where the narrator, Kristoffer Tabori, shines. He did so many different voices! There were some that sounded like George Kostanza's mother on Seinfeld, some that sounded like Joe Cool, and every single one just came completely to life. I loved the way he played Callie's father, Milton, as someone who grew from an awkward teen to a highly successful, brash entrepreneur. I liked how Desdemona grew from a shy, beautiful girl in rural Greece to a force-to-be-reckoned with Yia Yia that probably was the inspiration for all those Athenos commercials. Another strength of this book is in its depiction of Detroit, from the early days of Prohibition through the heady days of the American car boom and then past the terrors of the race riots. The 20th century was a riotous one in the United States, and Detroit is a great microcosm for that whole story. Looking over my GoodReads feed on this book, seventy-six of my GoodReads friends have read it before me, so I am not sure if I am bringing anything new to the discussion of this book! But if you, like me, have not read it yet, I think it's well worth the significant time investment. I'd say it's a great one for the cold, dark winter - it's the sort of book that will warm you right up and take you on a trip to Greece, to Detroit, to San Francisco and so many other places. And I bet it will make you think about gender and identity in ways you have never considered before. I really enjoyed reading this book too - and I had it for years before my book group chose it. To me it felt like a proper Great American Novel - there are so many novels described in this way but I thought Eugenides really did write one. It is quite epic in nature, so I definitely can see where it would get that designation. One of my absolute favorite books, I think it's destined to be a classic. And being from the Detroit area, you're right that it's a wonderful setting - and really does the area justice. If you haven't read The Virgin Suicides by Eugenides, I would recommend that one, too! Thanks, Shannon - I admit Virgin Suicides intimidates me based on the title alone, but perhaps it's not quite as scary as it sounds. Short time reader, first time commenter! I've finally read a book on your blog! When I first read this I was so impressed with Eugenides' writing style and Callie/Cal's journey, but over time I've fallen out of love with it. There seems to be a trend in early 2000s literature to take the story of an immigrant without the privilege of an elite education and to write that person's story in language often only learned in elite schools. I don't think stories about underprivileged characters should be dumbed down. However, I feel cold about books that talk about people they don't talk to. I guess I'm comparing Eugenides to Sherman Alexie or Tobias Wolff who both write about really smart outsiders from an underprivileged background. I feel like their audience is everyone, but I feel Middlesex's audience is people who could get into Harvard, even if they didn't want to do there or couldn't afford it. Eugenides went to an incredibly elite high school and college so I think Middlesex could very well be true to the way he thought and spoke as a teen (I know the book isn't autobiographical), and Callie/Cal did seem 'real' to me. It's just that sometimes I felt the writing was the star and the story was playing backup. I wonder if there was a way to merge both better. Thanks so much for commenting, Ellie, and for writing such a fantastic comment, too! You make complete sense. I don't know that I would call Callie underprivileged in this book - she went to a pretty elite high school and grew up mostly in Gross Point, which is a pretty tony area. As the story is told from her point of view, I thought the language used was pretty believable, though I can see where that could get hard to believe as you go back a generation or two (though the audiobook narrator definitely distinguished between them in accents). But I never thought about the book from the perspective you mention above, and I think it makes a lot of sense, certainly if you're comparing him to Alexie. And I can absolutely see what you mean about the writing being the star and the story being the backup - after all, we never really see Callie make the decision to have surgery to become a man, and we never see how she gets through college or how people who knew her as a girl (such as the Object) treat her as a man. I think I was remembering more about the cast of characters around Callie and the city of Chicago as being underprivileged. I flipped back through my book this afternoon and you're right that the story isn't really addressed at them as much as I 'remembered'. I had also forgotten how many great passages I underlined. He's really such a talented writer. He really is! I should look into more of his novels. This one has been on my shelf for a long long time too. I cannot wait to read it! Glad that you loved it. I loved this book! I am so glad you finally got around to it. One day I would like to reread on audio, but that would be down the road because so much else calling to me! Good to know the audio is good, though. I never particularly thought about reading this one until I listened to The Marriage Plot on audio. I loved it! I think I might plan on listening to Middlesex, too. Oh man, I loved Middlesex. I, too, had it for awhile before I read it. And I went for the audiobook too! I agree that it was fantastic. I'm sure I would've loved the book had I read it, but listening just had that extra something. Definitely one I'll revisit someday. I'm glad you liked it!